David Perley, Director of MWC and Susan O’Donnell, lead investigator of the FNI led the production of this report. Chris George, Brian Beaton and Shania Peter-Paul shared the work with the project leads. Suggested reference for this report: Perley, D., O’Donnell, S., George, C., Beaton, B. & Peter-Paul, S. (2016). Supporting Indigenous Language and Cultural Resurgence with Digital Technologies. Fredericton: Mi’kmaq Wolastoqey Centre. University of New Brunswick, November. 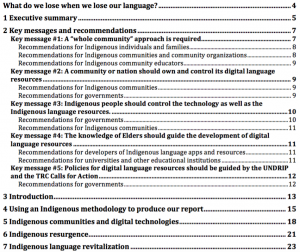 Some of the key findings and recommendations build upon the FNI earlier report about digital adoption in Indigenous communities. This entry was posted in Education, First Mile, National, News, Publications, Research. Bookmark the permalink.